Fears that hold you back are limiting you from experiences more than they are protecting you. I often get questions from people who are worried about traveling to countries where they don’t speak the language. Not being able to communicate can not only be frustrating, but sometimes it can even be a bit scary. But don’t let a fear of not speaking the language keep you from traveling. First, try to learn a few words ahead of time, like please, thank you, hello, good-bye. This will go a long way in showing the locals you’re trying. A phrasebook can help, but remember that you won’t necessarily understand the response you get. Write down names of cities, the hotel you chose, and any attractions you’re planning on visiting. It helps to show a taxi driver or someone you’re asking directions from if you have it written down since it’s unlikely that you will pronounce it correctly. Remember that English is the universal language of travel. 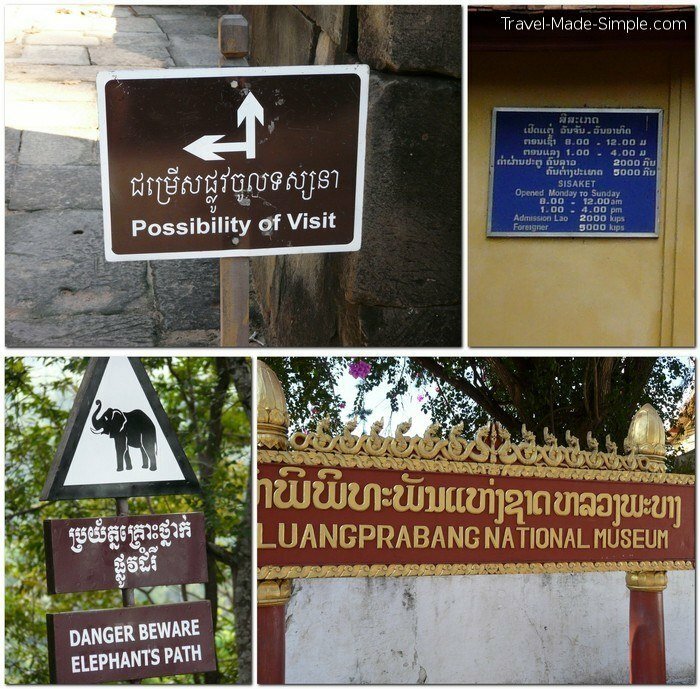 Sometimes signs at tourist attractions are even written in both the local language and English. If you are traveling to a destination that is used to dealing with tourists, you will find locals who speak at least a few basic words of English. But when you speak to them, remember to speak slowly and clearly (NOT louder) and use simple vocabulary. One of the few words I find to be almost universal is “toilet.” In the US people often ask where to find the bathroom or restroom, but that’s not so easily understood for someone whose native language isn’t English. But even in the middle of Southeast Asia, people understand the word toilet. Knowing a few key words and phrases can go a long way in making yourself understood and understanding others. Search for a travel phrase book for the country you’re visiting. Hand gestures and miming work well. When trying to order food, if you can’t tell what kind of meat something is, moo like a cow, flap your arms like a chicken, swim like a fish. Don’t worry about looking silly, you will be understood and the person selling the food will probably be even more friendly to you. Recently while traveling, my husband and I were looking for toilet paper. When the store clerk didn’t understand, Andy mimed wiping himself. Maybe a bit embarrassing, but he got his point across and the clerk burst out laughing. So instead of letting the fear of not knowing the language take over, just make a game out of it. Also try drawing. Andy and I were in a taxi in Izmir, Turkey trying to get to the castle, but the driver didn’t know what we were saying. So Andy quickly drew a castle. The driver laughed and nodded, and then brought us to the castle. If not knowing the language stresses you out, booking a tour might put your mind at ease. Book a full-length organized tour if you want someone else to take care of all the details. You’ll have someone around nearly every minute who can speak English and the local language, and they can help you out with any concerns. This is also a good way to feel like you have a safety net, and maybe next time you go on a trip, you’ll feel better able to tackle the language barrier. You can also book a day tour to start your trip, or a handful of day tours throughout your vacation. That way you’ll have the benefit of an English-speaking guide but you have a little more flexibility throughout your trip to do as you please. Try G Adventures for a full-length tour or Viator for day tours. Read online travel forums for reassurance. Chances are there are plenty of other people who have traveled to the destination you’re thinking of going. Search through the questions to see what people are saying about how easy it was to get around without knowing the local language. If someone else traveled there and figured out a way around the language differences, you can do it too. Just keep telling yourself that, and once you get there, you’ll believe it. Afterwards, you’ll feel great that you met a challenge head on and succeeded. It’s one of the many reasons I love to travel. It might seem impossible to travel to a country with a different language and sometimes a completely different alphabet, but remember how much of the world learns English. Even in less educated parts of the world, people who work in some sort of tourism job will most likely know a few phrases of basic English. Remember that simple hand gestures, miming, drawing, and pointing go a long way towards breaking through the language barrier. Don’t let a fear of not speaking the language hold you back. Just think of it as another part of the journey, and enjoy the ride. We have yet to come across somewhere where we we had problems with the language. You’re absolutely right. Someone speaks English everywhere in the world. Thanks Jennifer! I’m glad you haven’t had any major language issues while traveling either! This is sound advice Ali. 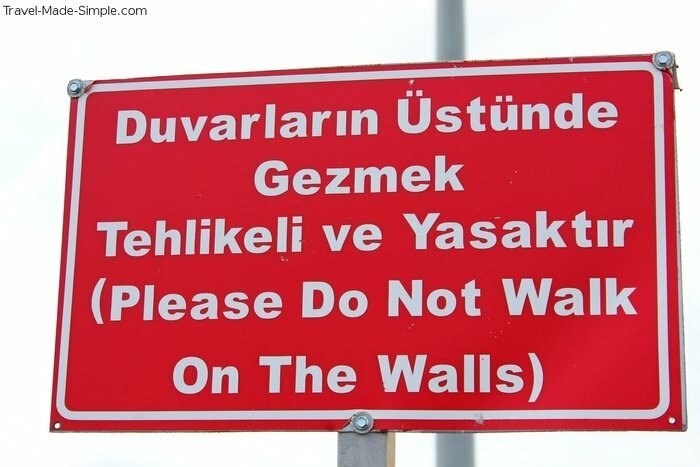 Your first sign about the walls is in Turkish and I remember when I was first in Turkey, how incomprehensible I found everything, despite speaking several other languages. After a few years living there I had developed a basic ability in Turkish, but I would never have been able to do that if it weren’t for the English-speaking capabilities of my Turkish friends. I would not have been much help had the situation been the other way around. I think language barriers are half the fun when travelling and hope they would not put people off visiting new places. Thanks Liv! Turkish was a little intimidating, but Andy and I found that we could figure out at least a few words based on the context. And it was so helpful that so many people spoke some English and were incredibly friendly. Not speaking the language shouldn’t be a reason to stay away from a new place, it’s definitely manageable and, like you said, part of the fun of traveling. Thanks Kristi! I always laugh at Andy miming things, like chickens or the toilet paper thing, because he looks ridiculous, but it totally works! Hello Ali. Some great advice in there, but I’d dispute one point, which is that English is the universal language of travel. Something in the region of 7% of the world speaks English natively, and another 7% as a second language. 14% or so is not that impressive, especially given how difficult it is to speak it well and given how easy it is to make mistakes and be quite unintelligible. You can travel vast swathes of the world and not encounter English, certainly away from tourist sites, in which case English becomes the mangled language of touts, scammers and people who view you as a dollar sign. Yes, sign language has a certain universality, and you’re very right to say that learning a few phrases of the local language is a great step; but anything beyond the basics can often be hard to do and a reliance on English presents a certain barrier to true interaction. Esperanto, however, presents a quick, easy and simple alternative. This planned language is about ten times quicker to learn than other European languages, and has around a couple of million speakers across the world. In pretty much any major (and not so major) city you’ll find Esperanto speakers, who through their international outlook and relatively low numbers have an incredible sense of community. They will always look out for each other or be willing to meet, host and show around. I learned a basic fluency in Esperanto in less than a year and have used it abroad to meet people and discover things I wouldn’t otherwise have done. It’s a gateway to a much deeper understanding of a destination and its people than simply battling through with English! Thanks for your comment Simon. This post, and my entire site really, is aimed at encouraging people to travel. My target audience is unlikely to travel to places that are that far off the tourist trail, and in touristy areas you will almost certainly find someone who speaks at least a few words of English, and that’s all that is needed. And not all of them are scammers, I have met plenty of friendly helpful people in other countries who spoke a few words of English and didn’t try to get a penny out of me. Maybe only 14% of the world speaks English as a first or second language, but how many have picked up a few phrases because they work in close contact with tourists? Probably a lot more than 14%. Obviously there are millions of people in remote areas of the world where there’s just no need for them to learn English, but most casual tourists aren’t traveling to those places either. Esperanto sounds good in theory, but try speaking that to someone in a normal everyday situation and you are likely to get a blank stare. That’s great that it’s relatively easy to learn and that its speakers have a great sense of community. But if only 2 million people worldwide speak the language, its usefulness is greatly limited, much more so than with English. If your numbers are correct and 14% of the population speaks English as a first or second language (and I don’t even think this includes someone who just knows a dozen phrases) than that means almost 1 billion people speak English to some extent. Seems a lot more useful to me. As I said, I’m trying to encourage people who haven’t traveled much to get out there see the world, or even more of their own country. I don’t expect them to go from not traveling at all to traveling so far off the beaten path that they will be the only tourist around for miles. English, even a few broken and mispronounced words of it, will work out for them where they are traveling. 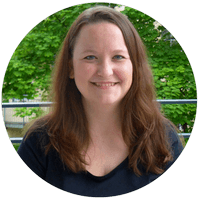 Your intentions are clear and noble Ali – and perhaps you underestimate the ability of a common language to enable that travel. Yes English will get you a certain distance, but Esperanto will do so many things to make travel easy – contact with locals, for instance, so it could be a real tool for very easy exploration of new places. Though frankly it’s not as fun as sign language when you’re looking for loo roll, admittedly! Miming that you need toilet paper is fun, and gets your point across very quickly! I hate playing charades-type games at home. Pictionary any kind of acting or drawing game – Hate it. But now that we’re travelling it’s the most fun thing EVER! I love miming what I need in a store or having to draw a picture of a boat when we can’t find the ferry station! It’s become super fun and I’m pretty sure I’m going to embrace those games once we get home!! Really great post – lots of people worry how they would cope if they don’t speak the language in a new place. Thanks Tracey! I’m not a fan of those types of games either, but it’s amazing how far you can get with a little silliness while traveling. I still laugh about the things my husband mimes to get his point across. Even without a common language, two people can figure out the basics and get by. I’m glad you liked the post! Excellent piece, Ali! You’re spot on with the language, with miming, and with not speaking more loudly! Here’s something that works for me: if you carry a pocket dictionary, you can hand it over so instead of just being understood, the person can communicate with YOU. I’ve found it invaluable in bridging the gap. 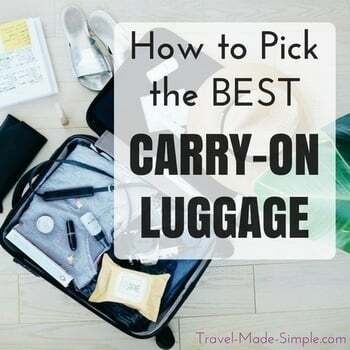 Keep up the great work in making travel simple! Thanks Leyla! Great suggestion about the pocket dictionary, that does sound very helpful. And thanks for the encouragement! what a beautifully describe. i love your article. i am couch surfing member and felt hesitation while meeting a new person. but i feel that language is not a excuse . 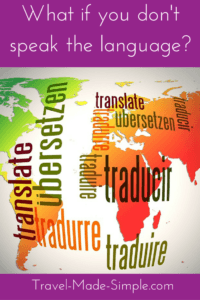 just speek not matter what you are saying your language can convey your message easily . Thanks! Yes, there are always ways around a language barrier. hey Ali, Im from INDIA and I’ve a question to you. I’m not fluent in speeking english but i can underdstand. for this i have a hidden fear in my mind. It’s preventing me to go out with my bagpack. what shall i do? Hi Abhijit! If your spoken English is anything like your written English, I think you’ll be fine. You need the basics, please, thank you, hello, where is the toilet, that kind of thing. If you bring an English phrase book with you, that should help. But it’s also worth having a phrase book for the country you’re going to. Start somewhere a little easier, either somewhere you know a lot of Indians travel to so you’ll meet other people who can help you out (London has a big Indian population), or somewhere like Europe where lots of people speak good English. If their English is good, it will be easier for you to understand. It might also be worth looking into a tour to get you started. That way you’ll have a guide who can help. I’m so sorry you’re afraid to travel because of the language, but I think you’ll find if you face your fear, you’ll realize there isn’t much to be afraid of. I’ve dealt with people who spoke no English, and you just make it work with hand gestures and pointing. There are always ways to make it work. If there’s anything else I can do to help, feel free to email me! While body language and gestures can be helpful, just also be aware that what’s appropriate in one place can be offensive in another. Gestures, miming and body language can be fun and entertaining too. I’m learning Italian at my own pace, so that would be helpful when I go to Italy. Definitely, good point Anne. Learning Italian should be fun, such a pretty language! Please, forget about English in France. I am writing to you now from the region called Limousin, and I have been living here for the last 3 months and what actually brought me to this article is that I wanted to see what people can recommend me in situation where a person doesn’t speak language of the community he/she is in. Here, in Limousin people rarely speak any other language than French, and the other most common is Spanish. I met one French girl here who spoke fluent English, alongside Spanish and German, and she openly told me she doesn’t like speaking English. Never in my life have I given a single thought about English language being useless. There are definitely parts of the world where it’s hard, if not impossible to find English speakers. Despite the reputation France has for not wanting to speak English (as you seem to be experiencing) I’ve actually had really good experiences there. Helps to try to learn a few words and always smile politely. But I’ve found that hand gestures and silly charades usually works well to get my point across. I hope things improve for you soon! I visited Paris last year to improve my French. I consider my French to be rather decent, however when I visited Paris the people always replied back to in English whenever I started speaking French. It got so frustrating as a language learner, everywhere I went nobody would speak anything but English to me. I got so angry in the end that whenever I got answered in English I just replied in Korean (my native language). That can definitely be frustrating! I think sometimes people think they’re helping. I speak Spanish (not fluently but good enough) and people often still switch to English when they hear my accent. We live in Berlin, and my husband is fluent in German, but at least half the time, people hear his accent and start speaking to him in English. At least you know you’re being understood! I know this is kind of very late in when you submitted this but I’m doing a project of people having to learn a native language and I found this is an good source for my writing it is very good but I just need the date of this article when you submitted it because it does not show the date and time. Thanks Gary, this post went live in August 2012. I am now in Poland and I speak a little Polish. Usually the first day I’m in a new place the fact that I do not know a language discourages me but after a couple o’days I always feel more confortable with it and it all goes fine. Thanks Rob! It can be a little intimidating at first if you don’t know the language, but like you said, things usually work out. I hope you’re enjoying Poland! I studied Chinese for a year and it helped immensely for traveling around Taiwan. However this winter I’m going to Honduras and I don’t speak any Spanish so i’m kinda scared. Desiree, that’s amazing that you speak some Chinese! I think it depends on where you’re going in Honduras, but in more touristy areas, you’ll probably find a little bit of English. It’s worth learning some basic Spanish to help you out while you’re there, like how to ask for the check, menu items, directions, things like that. But hand gestures work pretty well too. Just have fun with it, and remember that no matter what, you’ll have an amazing trip and figuring things out despite the language is half the fun! Hi Ali! GREAT article! I still find myself having a pretty strong fear of not speaking the language when traveling. I think it’s more of a self-consciousness issue as I’m a very sensitive person and want to be accepted. Even in Ireland (where my fiance and I are living temporarily for his job) I was so nervous the first month or two. Now after being here for a year I’m super comfortable, even if I have to say ‘what did you just say’ several times because of the Irish accents 🙂 The surprising part of all this is that I love language and consider myself pretty darn good at pronunciation. I just can’t seem to get over my fear. On a cruise last year my fiance and I made a stop in Naples and went to a pizza place not far from port. When I didn’t understand what the waiter said he started snapping his fingers at me (i.e. hurry up I need an answer) and I was back to square one, thinking the world hates me because I’m a stupid American who only speaks English. My fiance, however, could have cared less lol. I also had a bad experience in France when the airport security person was super rude because I didn’t realize she meant ‘step forward’ when she said it in French. I wish I could be like my fiance who doesn’t care what the heck someone thinks, even if he says the word completely wrong or doesn’t speak a lick of the language! I don’t know if you have any advice for getting over this fear of mine. I am one to learn a few words before traveling to that country but then I won’t say them because I don’t want to sound stupid! My dream is to become fluent in Spanish (I LOVE the language). Thanks again for the article and any advice you have to offer! Kim, I love Spanish too! I studied Spanish all 4 years of high school, I have a Spanish minor, I did a short study abroad program to Spain in college, and I took a language course in Quito about 6 years ago…still not fluent. But I don’t use it enough. Now I live in Germany and Germany is soooo much harder! I generally try to remind myself that they know I’m not a native speaker so they won’t expect me to say things perfectly. Same for when I’m traveling, although I think it’s even a little easier when I’m traveling because I can tell myself I will never see these people again, so who cares if they think I sound like a fool? If you know a few words in their language, they will just appreciate the fact that you’re trying. I think it’s a confidence thing. You, like me, don’t always feel confident in trying another language. But fake it. Even if they laugh or they’re rude to you, remember that you’re trying to speak their language, and remember that you won’t ever see those people again, so it doesn’t matter. And practice. You’ll get more comfortable with it the more you do it. If you love Spanish, take a class or get a tandem partner (where you speak Spanish half the time and English the other half) so you’ll feel more comfortable using the language. You’ll get there! 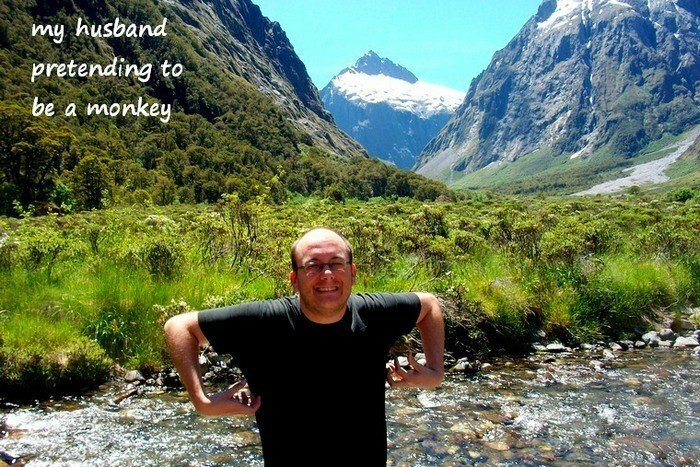 I looked but i couldn’t find the place in picture where your husband pretending to be a monkey. Can you tell? That scene is amazing. Thanks! That was taken in New Zealand somewhere in between Queenstown and Milford Sound. So not someplace where we would have a language barrier, but we were at Monkey Creek (or some similar name) and my husband was being goofy!